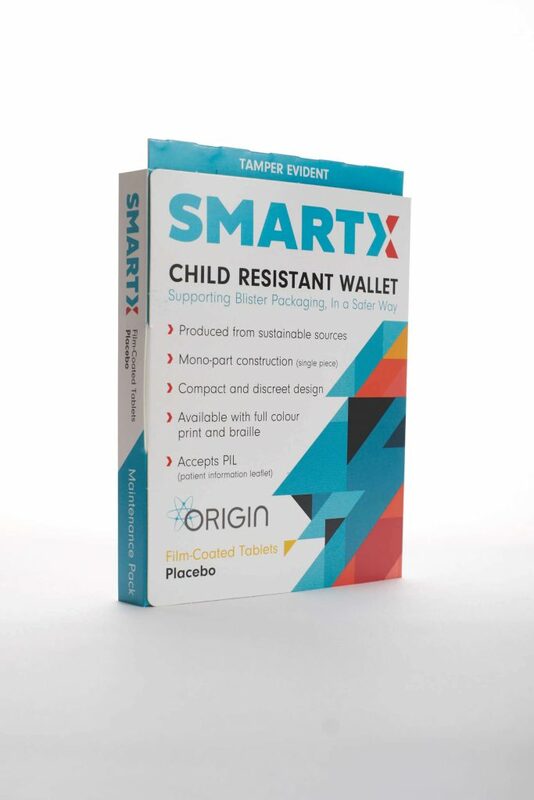 Origin, supplier and developer the SmartX certified reclosable Child-Resistant Carton Box for keeping blister packs safe from kids. Keep blister trays safe from children with this tear resistant container that stops kids from gaining access to the contents, making it safe for pharmaceutical & medical packaging. 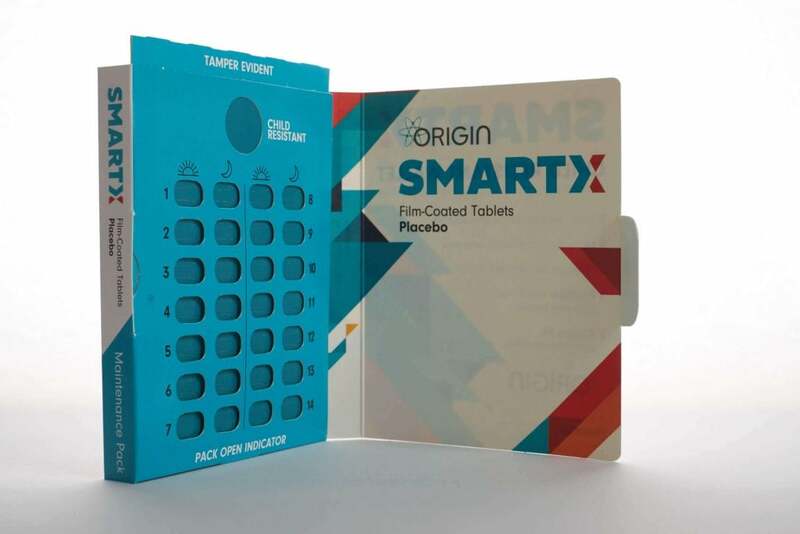 SmartX – the tablet wallet designed to deliver a multitude of benefits! This 2017 patented child resitant carton innovation from Origin Limited is developed from a single piece of folding box board and provides an effective, additional element of child resistance and tamper evidence to your product. 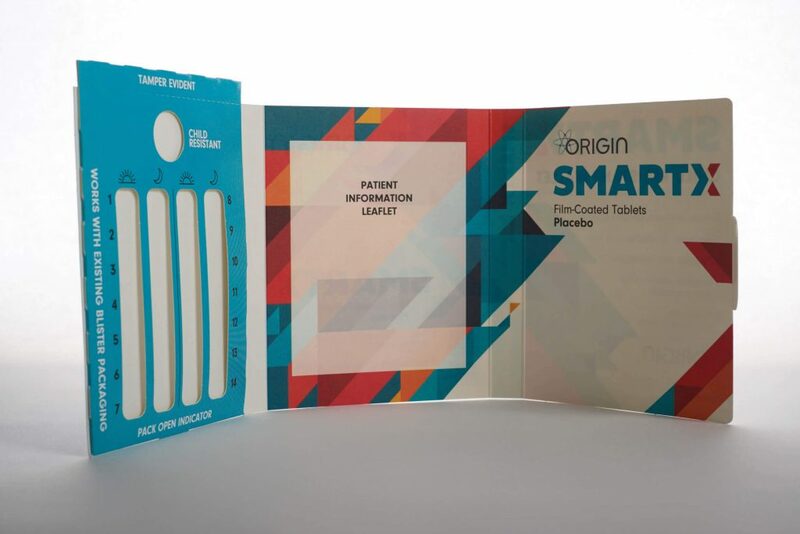 The SmartX product encapsulates your conventional blister packed product simply and securely and presents the same packaging in an entirely new way. Large panels enable full colour printing allowing recognition and promotion of your brand image. There is a blank internal panel provided to facilitate the inclusion of the Patient Information Leaflet (PIL), and there’s ample room for instructions in more than one language or braille. The device is designed to add tamper evidence and enhanced child resistance to the existing features of your blister product. Once loaded the tear band must be permanently removed to release the child resistant slider mechanism which moves to hide or reveal the apertures through which the user removes the product. Whenever the child resistant mechanism is opened a visible tab is exposed reminding the user to re-close the pack. And for those who don’t remember, returning the pack to the upright position will automatically close the child resistant matrix, hiding the blister apertures once more. Speed Sample is a unique samples service dedicated to speed, efficiency, communication and presentation. This is a bespoke service with each product enquiry personally managed from request through to delivery, supported by a full communication cycle. 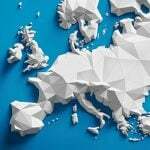 Experience a level of service unparalleled in the Pharma market! SmartX folds neatly to create a compact, pocket sized wallet. The spine of the wallet can also be printed to offer easy recognition when stored in pharmacy or in a medicine cabinet. SmartX is produced from either virgin or recycled material and always from sustainable sources. The device is 100% recyclable. 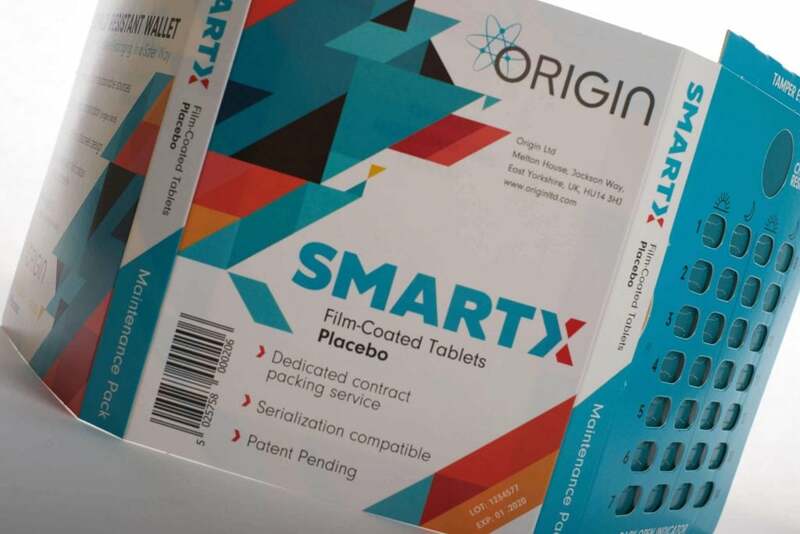 The board we use for SmartX can be designed specifically to suit the values of your current blister packaging and has the potential to take your inherent child resistance value from F8 to F1. The capacity of SmartX is completely variable and we can accommodate a host of tablet capacities. Whatever your need and whatever your product may be, if it’s worth increased brand dominance and you are concerned about your social responsibility to child safety and the environment, then SmartX is for you. Ask us for samples of this patented product. Hit the Request Sample Button today and have SmartX to view, plan and drive your brand with market leading child resistant design. Origin drives excellence in Child Resistant Packaging Design, find out more: Excellence in the design of Child Resistant Packaging for Pharmaceuticals, Origin.